For the past number of years, the SUV segment has grown at a pace never seen before. 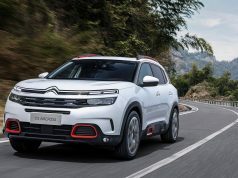 While Citroen have had the likes of the C4 Cactus knocking around for a while the introduction of the C3 Aircross has ensured that they are keeping up with the competition in terms of broadening their product range to satisfy customer demand. 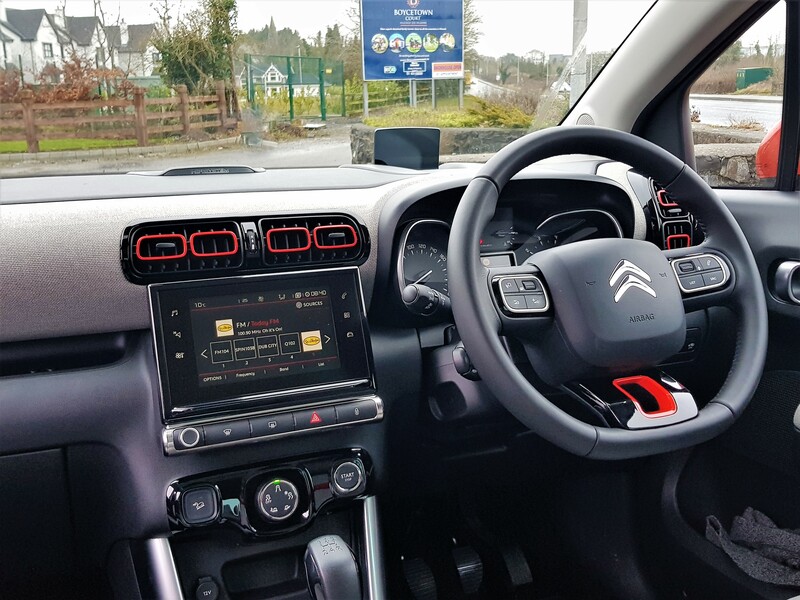 What Citroen appear to do quite well ahead of many of their counterparts is the ability to make your new Citroen your own with a vast range of customisation options. The new C3 Aircross is no different. You only have to take a quick look through their competitor’s product range to see the likes of the Renault Captur, Peugeot 2008, SEAT Arona, Hyundai Kona and Kia Stonic all vying for a piece of this lucrative segment. This indeed is stiff competition for the French brand. 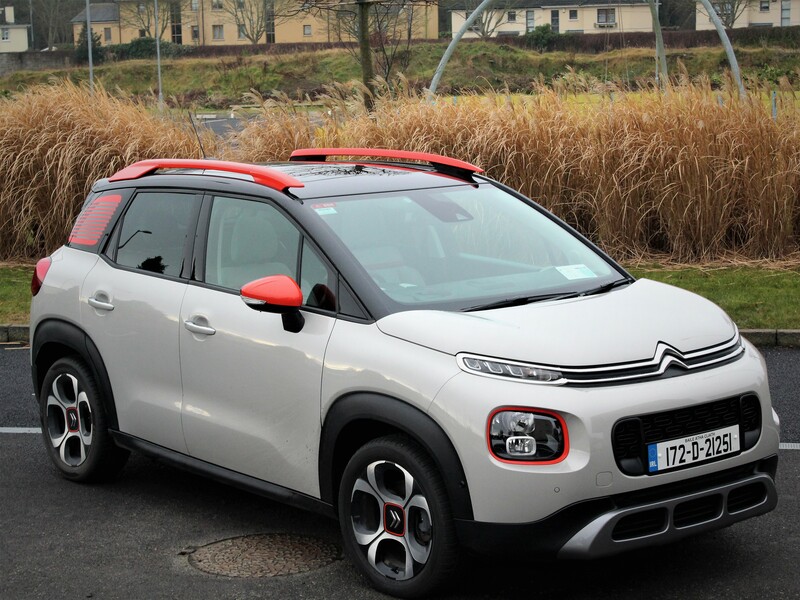 The new C3 Aircross is based on the C3 supermini whilst it gets its wheelbase from the C4 Cactus. This ensures that Citroen have been able to maximise interior space for a vehicle in this segment. 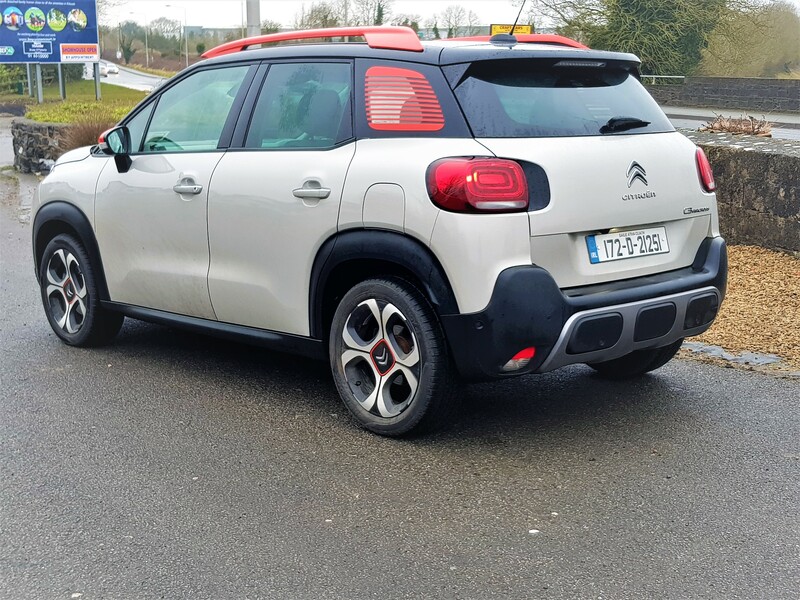 Whilst the C3 Aircross may poses the appearance of an off-roader, like so many others in the segment it is only available in front wheel drive. You do have the option of adding “Grip Control” for an addition €600 which my test car was fitted with to allow you to be a little bit more adventurous. Whilst I have experienced this system in some of the other PSA group models I wouldn’t have ventured out last week in the artic storms to put it to the test. From the outside, the new C3 Aircross has borrowed some of its detailing from the C3 while it sits some 16cm taller and has a chunkier and imposing front end. 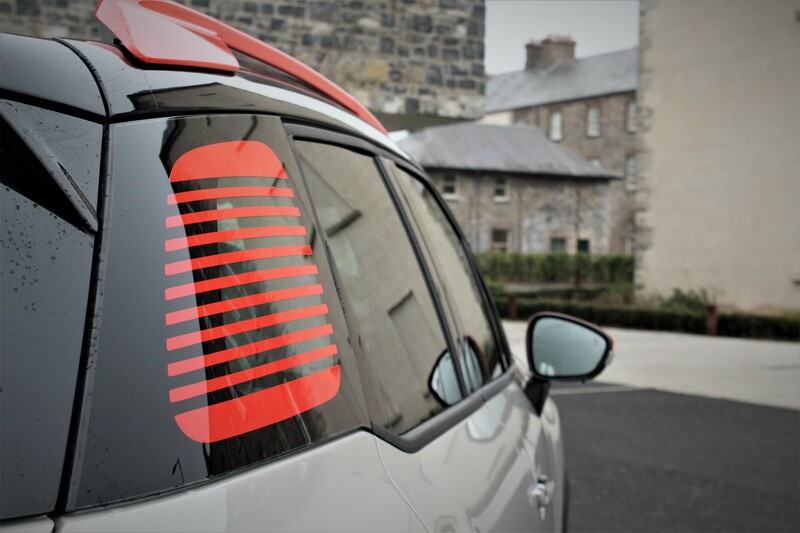 This is where the customisation begins with the C3 Aircross with a multitude of body and roof colour combinations available. 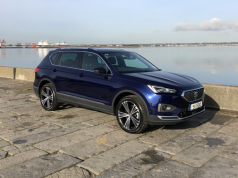 From a styling point of view it can be like marmite but I for one am a fan ensuring that in a segment where models have almost become generic Citroen can stand out firmly from the crowd. As you sit inside you will be greeted by the same level of personalisation. Space throughout the cabin is respectable and there is a light and airy feel to it. My test car was also fitted with the opening panoramic roof which is designed to increase the sense of space within the cabin. Whilst it may allow more light in I did notice that both myself and my 6-foot-tall passenger were very close to the roof lining when we sat into the test car on collection. This is due to a reduced interior roof height allowing for the working of the roof. The cloth finish across the dash and door trims matching into the seats highlights a touch of class when it comes to the materials chosen for the interior. Like the exterior, Citroen offer something different in terms of interior finish and it allows them to attract a broader range of customers. One draw back in terms of storage space within the C3 Aircross was the lack of cupholders up front. 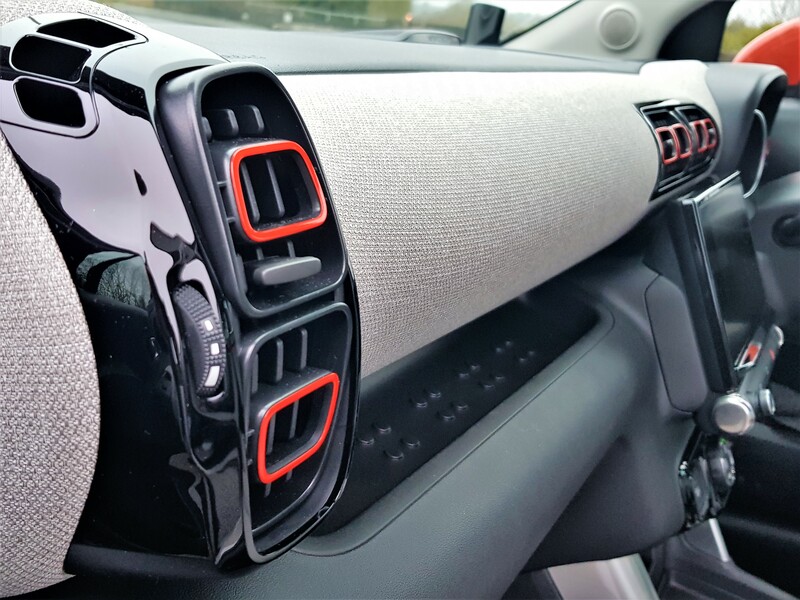 I had a similar complaint in the C4 Cactus where the Grip Control dial blocked the cupholders while in the C3 Aircross there is only one located at the back of the centre console under the armrest. It’s a small complaint but one I fear would weigh heavy on a daily commuter starved of their morning coffee! On the plus side the infotainment system is simple to use and pairing of your phone is doen with ease. Navigating the system is never a problem allowing you to find whatever it is you are looking for literally at the touch of a button. The new C3 Aircross is available in three trim levels; Touch, Feel and Flair with the latter being the subject of this review while there are two petrol engines and one diesel option available with the 110hp petrol engine being available in both manual and automatic transmission. Boot space ranges between 410 litres and 1,289 litres depending on seating configuration. If it were me personally I would be opting for the mid spec Feel trim or the top spec Flair trim. Flair offers a multitude of options including 17-inch alloys, bi-tone roof, various exterior colour packs, venetian blind effect in the rear quarter panel window, Active Safety Brake, Emergency Braking, Forward Collision Alert, Automatic high-beam control and driver attention alert as well as keyless entry and start, sat-nav and a flawless wireless phone charge dock. On the road, the proven 1.2 PureTech 110hp petrol engine performed brilliantly paired with the 5-speed manual transmission. The engine never felt like it needed to be over worked to get where you wanted to go which is often the case with the small three-cylinder powerplants. The new C3 Aircross is perfectly capable of holding its own even on a winding country road taken at optimistic speed. Whilst the steering has alight feel to it, it is still accurate which is a massive plus. Wind and road noise are kept to a minimum and the petrol engine was never too intrusive over the course of my week-long test. Overall, given that the C3 Aircross is stepping into one of the most competitive segments in the motoring industry at the moment Citroen have made a good stab at producing a car that will turn heads, get buyers thinking and offering a vast range of customisation so every buyer can indeed be unique. If the small SUV market is where your euros are going I would encourage you to include the Citroen C3 Aircross on the list of cars to test.